Description A hydra will eventually die of suffocation if one of its throats is strangled, even if the rest are left alone. Steps To Reproduce The fastest way is to put a hydra and a bronze colossus in the arena, and take control of the colossus. Could be intentional, as in with a hydra one head chopped off is instant death, same with one brain destroyed. Hydras dying from losing one head was supposed to have been fixed in 31.01. If they're still doing that, there's a problem. I just tested, and they're not still doing that, so at least that part's fine. They will lose enough blood to make them Pale, which may or may not be intended behavior. Still happens in 0.40.02. I tested it in the arena with a Bronze Colossus; the Hydra suffocated after strangling its throat on the third neck 371 times. Figured I'd go ahead and point out that while they don't die from losing heads (I had just previously lopped the heads off of another with an axe) but my idea to use the second hydra in this lair for wrestling skillups was rather quickly cut short. Never tried to strangle one, seemed like it would be absurd to even try, but autoattack > close combat mode for skillups killed it pretty quick in 43.02. They are modded but that is only improved material properties to give tougher bones/scales, so yeah, I was gonna report it but figured I'd check and see if it existed first. 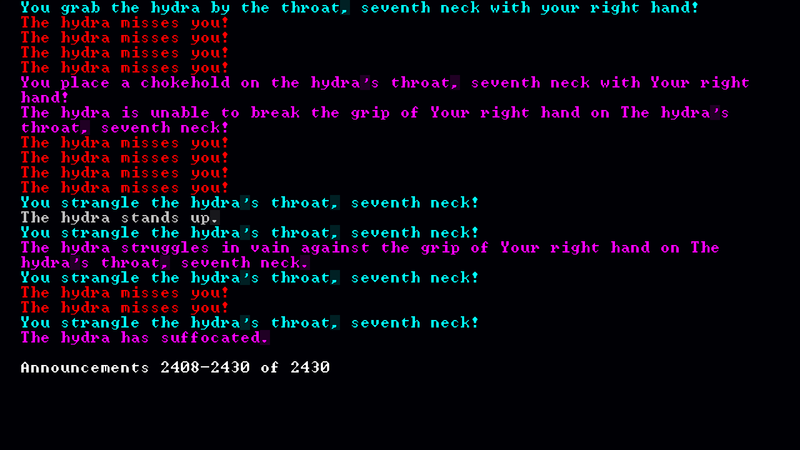 It can be fixed manually by modding hydras to have no THROAT body part. 2010-08-01 11:25	 toybasher	 Tag Attached: Intentional/Expected? 2014-01-27 20:43	 Footkerchief	 Tag Attached: Fixed in 0.34.12? 2014-07-07 22:23	 Footkerchief	 Tag Renamed	 Fixed in 0.34.12? => Fixed in 0.40.01? 2014-07-11 04:44	 Knight Otu	 Tag Detached: Fixed in 0.40.01?